Manufacturer of a wide range of products which include automatic milk pouch packing machine, ghee pouch packing machine and automatic butter milk pouch packing machine. 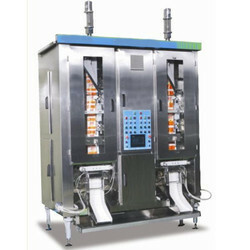 This Milk Pouch Packaging Machine is extensively used in the consumer goods packaging industry and come with precision designed and optimum functionality standards for packaging of Milk. These machines come with advanced technology based Servo control, an electromagnetic clutch and break film draw mechanisms that make these efficient performers. Pouch Capacity 200 gm to 1 Kg. Enabled by a group of qualified experts, we have the capacity to offer our customers an extensive variety of Automatic Ghee Pouch Packing Machine. Used to pack sodas, milk, mineral water, the offered bundling machines are made using gentle steel under the course of talented experts. We gave bundling machines are decently tried on different quality parameters to guarantee their imperfection free nature at client's end. We offered automatic buttermilk pouch packing machine. automatic buttermilk pouch packing machine is widely used in dairy industries. 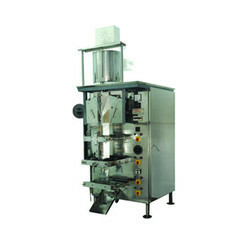 automatic buttermilk pouch packing machine is very compact and easy to operate. automatic buttermilk pouch packing machine is working on gravimetric timer base filling system, which system gives us very accuracy filling and less spoiled of a pouch.